Over the next while, I'm going to look at different ways to paint metallics. Most people are familiar with "True" and "Non" Metallic Metals, but I use more methods than these two and you're going to get to read about them all! Sound good? "True" is the term given to using shiny metallic paints that actually shimmer like metal does. 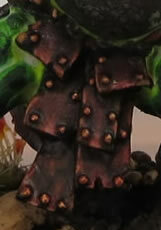 It also means that as you move the model around or look at it from different angles, the highlights change. This is by far the easiest way to paint metal and is the most "realistic" way to paint shiny metal. (I say "shiny" because some metal is naturally dull and you're better off using Non-Metallic Metals.) It has both colour and reflection. In the photo below, you can see the difference between TMM and NMM. As I turn the model under a fixed light source, the highlights and shades on the TMM (The RED section.) changes, starting very bright and getting dark as it leaves the light. The rest of the axe (White/Grey sections.) 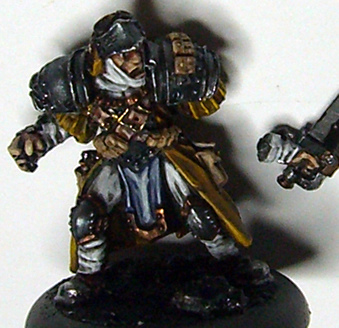 are painted with NMM and you can see that it stays roughly the same bright / darkness the whole time. but this keeps a certain element of a highlight visible, no matter the angle the light hits it. Pick up the paint that you want, be it silver, gold, bronze, etc and paint it on. (Optional) I usually recommend a black wash over metals, but there's still a lot of people not using washes. Metallics can be a little stark on their own, essentially, just like any other paint. A few simple layers will go a long way to making them look better. tint the armour for a cool blue-grey look. Use a black base to create a dark shadow for your metal. If black shadows are too strong for you, use greys as a base for silver metals, brown for golds, etc. Dry-brush metallic paint over the black. This basically means using a rough brush dipped in paint, wiping most of the paint off on your cloth, then quickly swiping the brush over the piece you're painting. The light paint coating should cover all the raised areas and leave the indents black. If dry-brushing isn't your thing, just paint the metallic over the black, focusing on raised areas and avoiding shadowed areas. Wash the metal with a black wash.
Or, use a brown wash on golds, coppers, etc to appear softer. Alternatively, use a coloured wash to add some colour / tint / alien world reflection to the metal. 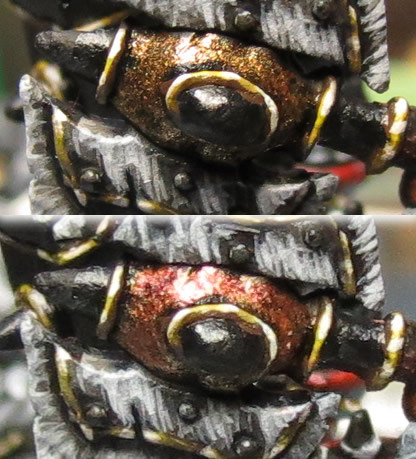 I usually suggest using an off metallic to highlight with as it'll bring out the effect of sharpness and wear. Often this would be silver, but doesn't have to be. On this red-metal loin cloth, used more red metal to edge and bronze for bolts. The bronze mixes things up nicely to add a little variety. Metallics can be layered and painted just like any other paint. You'll need a selection of TMM paints or your own Iridescent Mixes. (More on that below.) Then just paint light you normally would, starting either with darker metals and painting lighter or with lighter metals and painting in to the shadows. 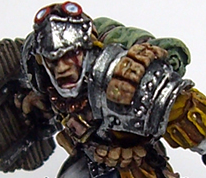 In addition to the above method of using brighter metals to highlight darker ones, you can also layer different metallics to create a multicoloured finish on your metals. Blue/Green Metallic also works well. 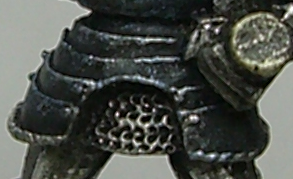 Guilty secret: I love painting chain mail. Always have. There's something about brushing silver over loops that just speaks to me. Careful, all those little holes can create air bubbles that prevent paint from getting in and leaving you with primer or bare metal. Make sure these are all taken care of first. Dry Brush a layer of silver. Dry Brush more layers of silver towards edges, leaving shadowy areas darker. You'll notice I've mentioned it a few times. Dry Brushing is a technique that as I've become more skilled, I've moved away from. It's a GREAT technique for doing quick and easy highlights when you're starting out but starts to look a little rough as your quality improves. While I still tend to avoid it, opting for a controlled stroke instead, sometimes I still apply it to metals, because the roughness lends to aged and worn surfaces. You can also create your own metallic paints by mixing any colour with what's called Iridescent Medium. This medium is basically a clear/white-ish paint full of those minuscule flecks that make metallic paints shine. One reason some might go the NMM route is because they're after a certain colour of metal that they just can't get out of normal metallics. But with Iridescent Medium, you can turn any paint - or mix of paint - into a metallic. The amount to mix depends on your medium. What I demonstrate below is how silver paints like Chainmail and Mithril can be used to create metallics, they imbue a certain amount of "grey" into the mix. You can add more colour, but that reduces the shine and darkens it more. Instead, Iridescent and Pearlescent mediums can offer a better mix with stronger colour. Iridescent is more sparkly like your normal metallics while Pearlescent is more subtle. It's also worth noting that some of the craft stores have a wider selection of coloured metallics. (Places like Hobby Lobby or Michaels.) For example, I've gotten plenty of use out of my Red Metallic.